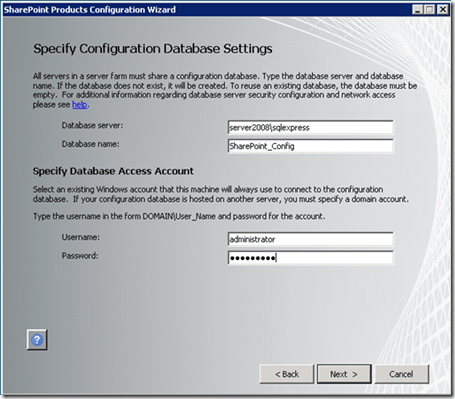 I’ve been poking around to find out where SharePoint Foundation 2010 beta actually puts the content databases when you do a default installation. It certainly wasn’t where I expected it to be. As you can see from the above screen shot it ends up in c:\program files\common files\microsoft shared\web server extensions\14\data\mssql10.sharepoint\mssql\data. Now there is nothing really wrong with the location per se but it sure is a mouthful. Personally, I don’t like long data paths as it generally adds complications. Now I know that the content database location can be moved and I certainly hope that SharePoint Foundation 2010 beta includes a wizard to do this because I’d actually like to move ALL the SharePoint data (content databases, search index, configuration files, etc) into a single directory somewhere just off the root of my drive. The reality is that I’m not really expecting to find a wizard to move all this data so I suppose I’ve just gotta get used to it. I’m I the only one that thinks doing this has made things more complicated? 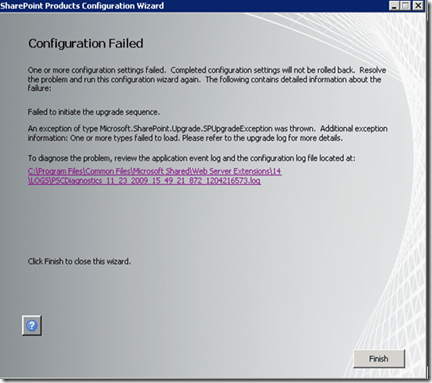 I’ve now progressed to trying custom installations of SharePoint Foundation 2010 beta. This means that I basically want to set it up in a server farm configuration. If you install SharePoint this way you firstly need to have the database server in place. No problems because before I commenced the SharePoint installation I installed Windows SQL 2008 Express Edition intending this to be the location where SharePoint stores its content databases. And press the Next key, as I have done many many times with Windows SharePoint v3. Low and behold, something different happens. 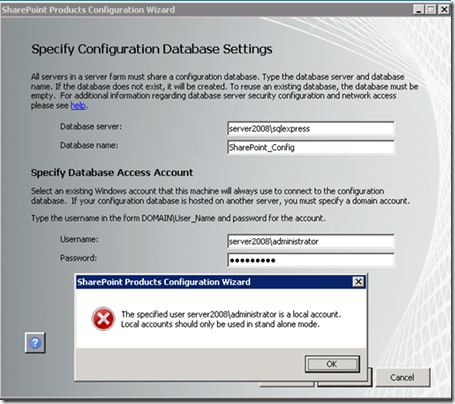 The specified user server2008\administrator is a local account. Local accounts should only be used in stand alone mode. and I can go no further with the installation. I’m not sure whether this is an issue because of SharePoint Foundation 2010 beta or Microsoft SQL Server 2008 Express Edition. Whatever the case, it appears that I can create a SharePoint server farm on a stand alone server, it has to be connected to a domain. This was certainly not the case previously with Windows SharePoint Services v3 and Microsoft SQL 2005 Server. So here’s the first major configuration difference I have discovered. You have been warned! <img src="http://lh4.ggpht.com/-EekXbddPIoQ/UQm71JS-d7I/AAAAAAAAIMg/uf-pXlsIE4w/video8614fcfa6c10%25255B7%25255D.jpg?imgmax=800" style="border-style: none" galleryimg="no" onload="var downlevelDiv = document.getElementById('db64d383-fea8-4dff-9e52-3c354778fd35'); downlevelDiv.innerHTML = "
<img src="http://lh3.ggpht.com/-5zbgKBiDPzE/UQm72OdhPWI/AAAAAAAAIMo/-mvLqxSoaqk/video54078b79cd33%25255B6%25255D.jpg?imgmax=800" style="border-style: none" galleryimg="no" onload="var downlevelDiv = document.getElementById('156eb2e7-03e9-40c0-a7f8-c384b48ac1d7'); downlevelDiv.innerHTML = "
<img src="http://lh5.ggpht.com/-H6pM31NZQh4/UQm72-S8goI/AAAAAAAAIMw/o5JTicWz8sg/videoc51ac97298b2%25255B5%25255D.jpg?imgmax=800" style="border-style: none" galleryimg="no" onload="var downlevelDiv = document.getElementById('a4ac2443-50aa-4300-9191-589862ef4eef'); downlevelDiv.innerHTML = "
<img src="http://lh6.ggpht.com/-DkMsu0M0myk/UQm73gSylCI/AAAAAAAAIM4/7ItcG6F6NUQ/videob2dea11a10be%25255B4%25255D.jpg?imgmax=800" style="border-style: none" galleryimg="no" onload="var downlevelDiv = document.getElementById('ce494035-5dc8-444d-af99-9216ce709ca5'); downlevelDiv.innerHTML = "
If you’d prefer to download the whole presentation directly to your desktop just send me an email (director@ciaops.com) and I’ll send you the link. Watch out for our next webinar on Thursday the 10th of December. Details will be posted here soon. 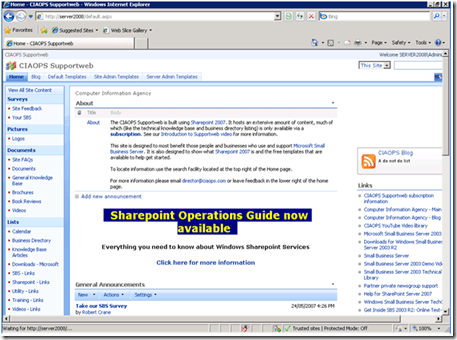 I’m not going to continue to prattle on constantly about my failures and hopefully some successes with SharePoint 2010, but I do want to take an opportunity to illustrate the fact that the testing, like you have seen over the past few posts, all ends up in my Windows SharePoint Operations Guide. This means, that if you are a subscriber, you are going to save plenty of time by not having to determine how to get everything working. That is my job. I do all the hard yards testing and retesting all the options. 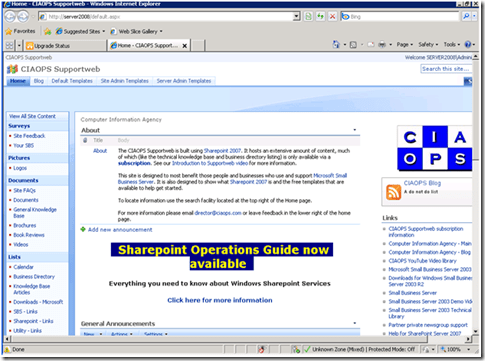 Everything that I learn about SharePoint ends up in the Guide not just SharePoint 2010 but also Windows SharePoint Services v3 (WSS), Microsoft Office SharePoint Server (MOSS) and Business Productivity Online Suite (BPOS). It’s all there, with more being added every month. I’m happy to announce that from December the complete Guide DVD will be available for download every month. Be warned, that means > 4.3GB of information through your Internet connection. It is also starting to look like I’ll have to expand the Guide onto a second DVD starting in the New Year. I’d challenge you to find a more comprehensive SharePoint resource (perhaps apart from Microsoft themselves) for the price. 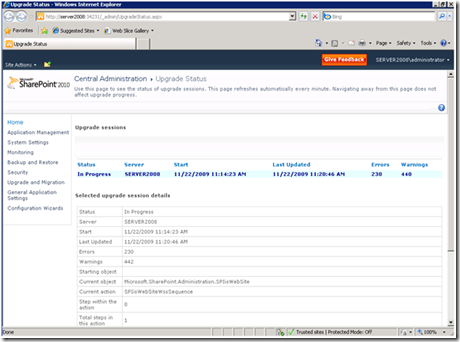 So if you are a subscriber watch out for the December update which will start to include information on SharePoint 2010. – How to upload and management documents. – How to work with lists. This webinar will show you the basics of using a SharePoint. It will help you understand the benefits of using SharePoint to store documents and other information. You’ll also learn the basics of extending a SharePoint to include features such as wikis and sub sites. 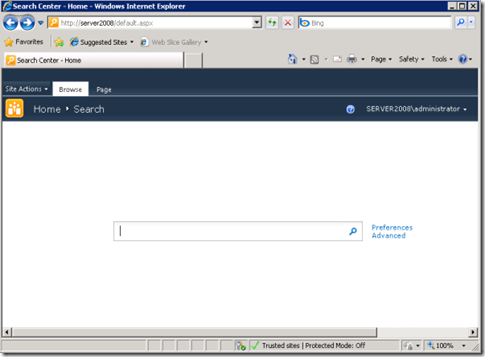 With all the hoopla surrounding SharePoint 2010 beta you should also not forget that there is also a new beta for Search Server Express. Like the previous version, Search Server 2010 Express is a free download from Microsoft. As you can see from the above screenshot I have just completed installing it and am now beginning to learn about what makes it tick. I am still at a loss as to why more people don’t see the benefit of Search Server Express. It allows you to index just about all your documents on your file servers including all the information inside them without having to make any changes and search them from a web interface. This means no matter how messed up your existing file storage is, with Search Server Express you’ll be able to find what you’re after. Just about everyone uses Google to find stuff they want outside their business yet they have NOTHING to achieve the same inside their business. Am I the only one that sees the opportunity here to provide a solution? Am I the only one that sees the opportunity to do this with a product that costs nothing to obtain? Clearly I must be, because no one else I have ever met has even heard of Search Server Express. As I have said in this blog before, it is no longer about the information it is about finding the information you want quickly. Google has built a multi-billion business doing just that so why hasn’t it be done inside businesses? Beats me, but don’t say I didn’t tell you how it could be done. After the last failure I created a new clean Windows SharePoint v3 site. I then added all the Microsoft templates that are present on my Internet facing site. 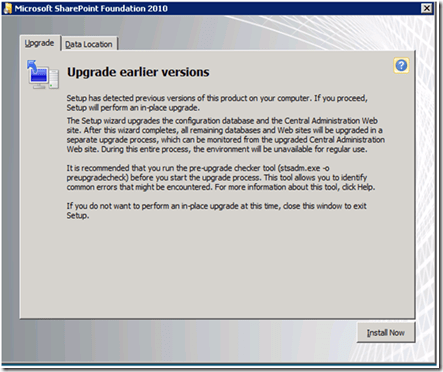 I then restored the Internet facing site from a backup and commenced the upgrade to SharePoint Foundation 2010 beta again. An exception of type Microsoft. 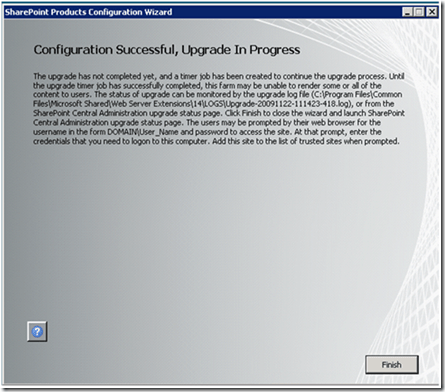 SharePoint.Upgrade.SPUpgradeException was thrown. Additional exception information: One or more types failed to load. Please refer to the upgrade log for more details. Now this is interesting, because in my last attempt (with no additional templates) I got past this stage (even though it failed later). Whatever the result I’m going to have to dig deep into the log and start trying to work out what the problem is. If you have never done this let me tell you it ain’t much fun. Since I wrote the post of ‘Being busy is just an excuse’ I’ve come across some additional information that reinforces the premises I put forward. I came across a something that said ‘achieving perfection is about elimination’ which resonates very strongly I believe. When a sculptor creates a work they don’t do it by adding something to what they started with, they generally chip away and remove stuff to create their work of art. The same is true about life in general I believe. You need to eliminate, simply, declutter and generally do less to achieve your goals. I’ve also found a very interesting piece by Jim Collins who wrote the books Good to Great and Built to Last. At the beginning of the year he doesn’t make a traditional ‘to do’ list he makes a ‘not to do’ list. Novel eh? You’ll find the whole article on his web site but again it demonstrates the point of achieving the things you want by not doing the things that waste your time and are unproductive. The basic idea being that you set your ideal work schedule and then MAKE everything fit into that. The above blog post from Carl is a highly recommended read for people who claim they are ‘too busy’ to achieve things as there are also plenty of other helpful tips in there. So if you are too busy you have no one to blame but yourself. The good news is that you can makes the changes requires to actually achieve so much more by actually doing less. The proof is in the pudding as these articles demonstrate. I’d urge you to at least give it a try and whether you can make it work for you. 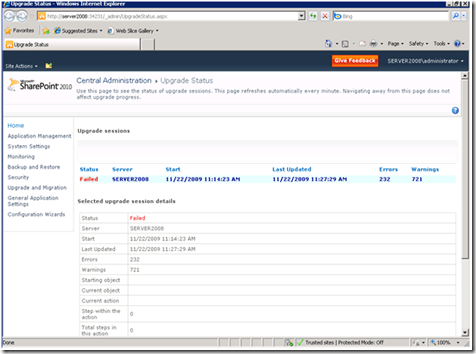 The next test on the list to conduct with SharePoint Foundation 2010 beta is an in place upgrade. In this case what I did was create a new Windows SharePoint Services v3 machine and use the STSADM command to import my existing internet facing SharePoint site http://supportweb.ciaops.net.au. 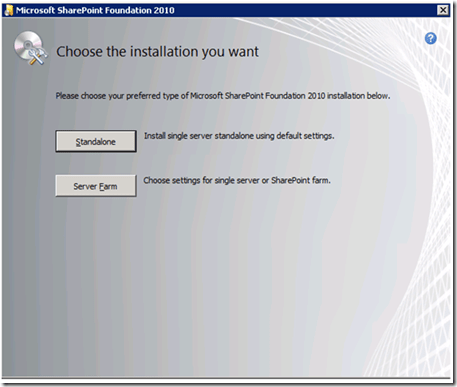 I then commenced the installation of SharePoint Foundation 2010 beta. At the end of the configuration it commenced the site upgrade. Which you could view from the browser. Unfortunately, after a while the upgrade process failed. The good thing this time was the original site was still working. Looking at the error log that was produced (with 233 errors), most seem to be about missing components (i.e. templates, add-ons etc), so I get the feeling it would have probably worked if I had done the migration on the original box where all the other add ons are installed. Problem is, that box isn’t 64 bit so a migration to a new 64 bit base machine is going to be necessary. Clearly, that is going to make any migration process that much longer and more challenging in that you have to get all the extra little ‘tweaks’, you added across onto the new machine before you attempt an upgrade. That could certainly take some time and test your memory! So, it’s back the lab once again.